There's something magical about children's books. It's such an important and influencial part of growing up that no kid should be left without. 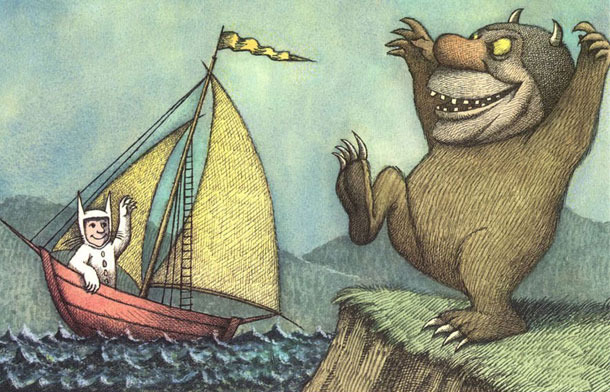 One of our favourite books growing up was WHERE THE WILD THINGS ARE. A book written and illustrated by Maurice Sendak (1928 - 2012)... we're obsessed with his crazy, quirky and other-worldly artwork. A story of only 338 words, it follows the main character Max who turns his bedroom into an imaginary jungle after being sent to bed without his dinner. Max becomes king of the Wild Things, playing and dancing with his new buddies... soon returning back to his room where he finds a nice hot dinner waiting for him. Written and drawn before 1963, all the amazing illustrations where done by hand. We also found and love a brand called Leg Avenue who make adorable little King Max costumes. So if your tiny monster is a fan of the story, he or she now has the perfect Halloween costume sorted. Good Night Stories For Rebellious Girls is a children's book by Elena Favilli and Francesca Cavallo which features 100 bedtime stories about the lifetime of 100 extraordinary women. From Frida Kahlo to Serena Williams, each woman's life has also been beautifully illustrated by a female artist from around the world. It all started from a successful Kickstarter campaign, with over 13000 supporters, the book is now available worldwide as a hardcover, ebook or audiobook. But we suggest getting out of the house and visiting your local bookstore to find one. Bedtime doesn't have to be boring.